Drapers were apprenticed for three to four years. A premium of up to £100 was paid by their parents or guardian, returned at the end of the term if the apprentice's service had been satisfactory. Most apprentices spent their first year sweeping, dusting, unpacking boxes, learning to cut material and tying packages. 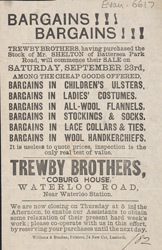 Apprentices would begin dealing with customers by selling haberdashery and would eventually graduate to serving customers in the main store. Hours were long and pay was low but if they worked hard there was the prospect of promotion, job security - and the potential to set up on their own after learning the trade thoroughly.